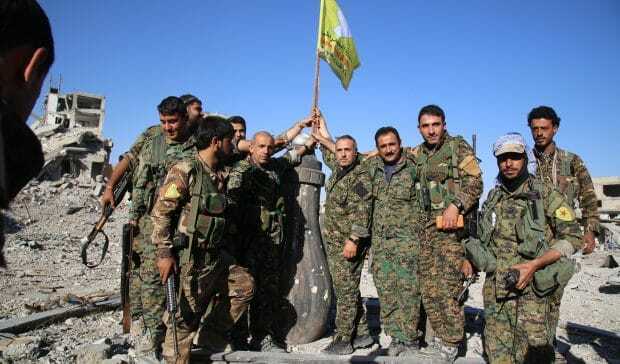 Kurdish factions, Russia, and the regime entered talks last year after the Kurdish groups took 27% of Syria, in the north and east, mainly from victories over the Islamic State. Incentive was added in December when Donald Trump announced the withdrawal of all 2,000 US troops in Syria. The Americans have supported the Kurdish-led Syrian Democratic Forces in the fight against ISIS, while protecting the Kurdish groups against attacks by Turkey — which considers the Kurdish YPG militia, the leading in the SDF, as part of the Turkish Kurdish insurgency PKK — or by pro-Assad forces. But the Assad regime has refused any consideration of Kurdish autonomy, and the Pentagon and US agencies have pushed back on Trump’s order, ensuring up to 1,000 US personnel remain in Syria in the near-term. The Assad regime has renewed threats to regain “every inch” of Syria. Defense Minister Ali Abdullah Ayoub said last month that the military will attack if Kurdish leaders do not submit to regime authority. Jia Kurd accused Russia of putting its cooperation with Turkey ahead of a deal: “[Moscow has] not played its role after meeting the Turkish side many times and this is what led to the blocking of the path of dialogue with Damascus and Russia bears the historic responsibility,” he said. After months of confrontation, Russia and Turkey repaired relations over Syria in August 2016. The two sides have declared a demilitarized zone in northwest Syria — although the Assad regime is violating it regularly, and the Russians are occasionally bombing — after Turkey and Syrian rebels pushed out Kurdish militia in early 2018.